I have been eyeing strawberries for the past month while grocery shopping. And I have been waiting for them to get just right. When berries start popping up at the store I am always reluctant to buy them right away, because they sometimes show up a bit early and aren’t as flavorful as I want them to be. However I did buy a few baskets in the past 2 weeks and I have to say they are sweet and so good! The smell of strawberries alone is completely addictive, but when they’re juicy and sweet that is when I go all in. 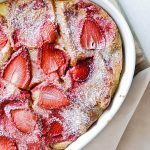 I love to chop a few strawberries and mix them in my morning yogurt or just nibble on them during the day, but I also love to bake with strawberries. Who doesn’t? And as I was grocery shopping I also picked up two challah loaves. These are my weakness. Apart from freshly baked, still warm bread, I don’t really crave bread on a daily basis and don’t eat it daily either. Challah though is dangerous to have around. I’m totally capable of eating the whole thing myself, snacking on it throughout the day and that’s baaaad. But it’s challah, you know? 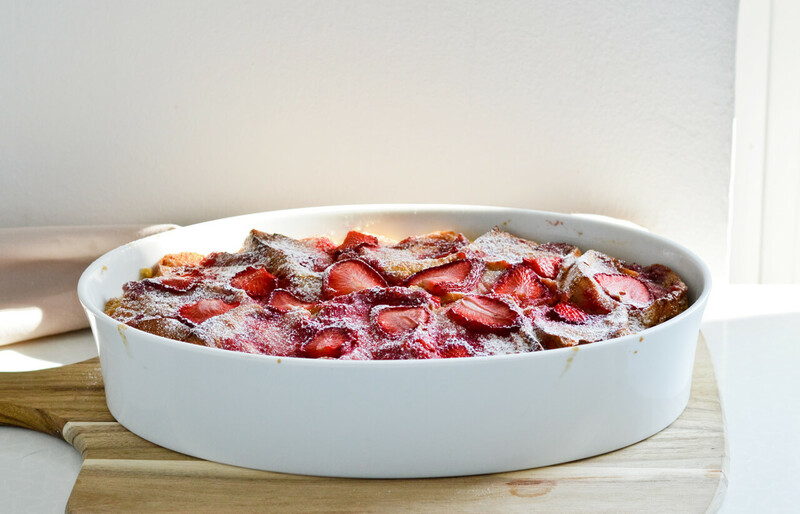 So the minute I put challah in my cart, along with the strawberries I just knew I had to make strawberry challah bread pudding. 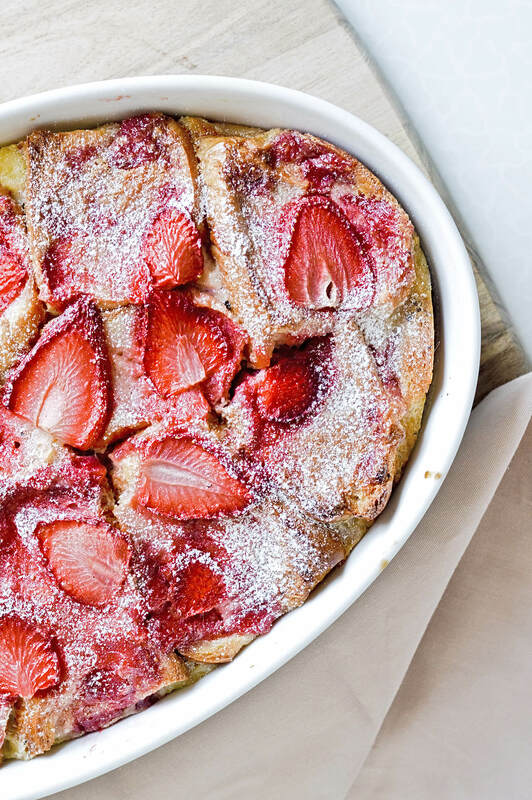 It’s the ultimate dessert / brunch food. 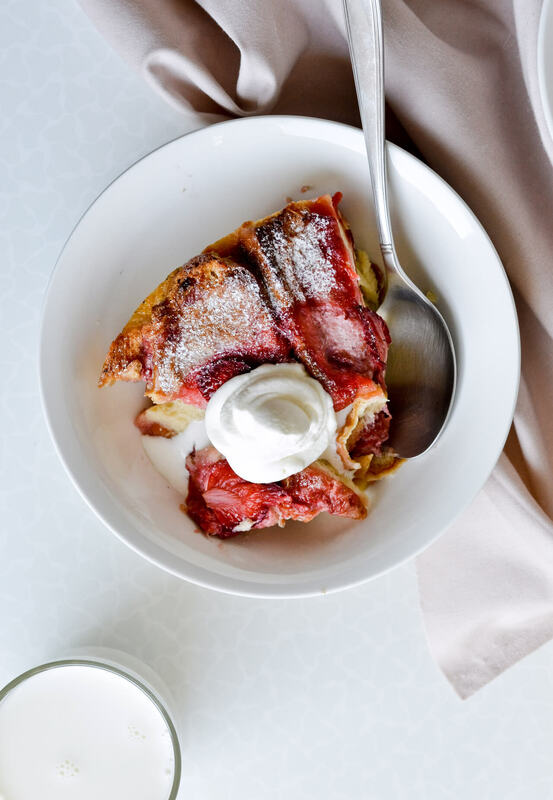 Soft buttery challah smothered with vanilla custard and strawberry sauce. Add some whipped cream or ice cream and put on some stretchy pants because this stuff is amazing! In my world anything you can eat with a spoon is amazing and I point this out a lot, I know. But I really sometimes wonder why my name isn’t Comfort Food? It would fit me so well. That’s what I’m about. 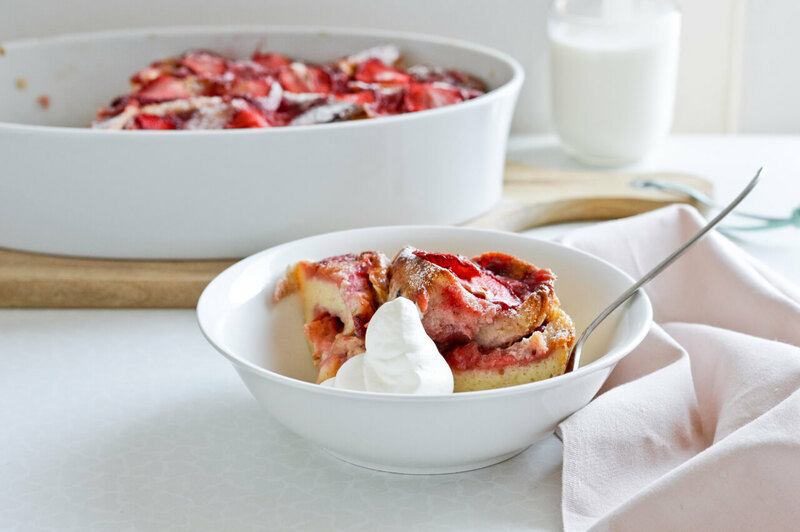 This strawberry challah bread pudding does need almost 2 hours from start to finish until it’s made, but the actual process of making it is quite simple. 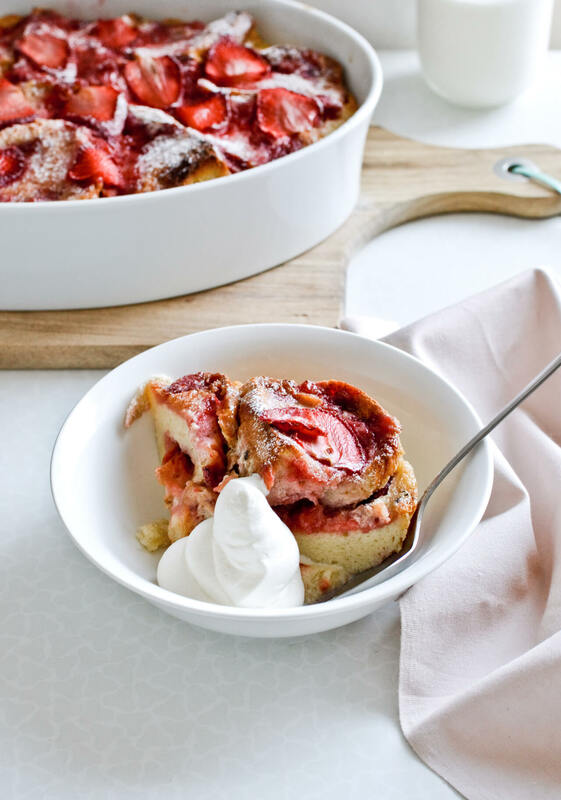 The challah is sliced and placed in the pan, followed by a quickly made easy strawberry sauce and vanilla custard which is made in no time too. You can eat this warm or cold, it’s good either way. Since there’s only two of us and this can easily serve 6, we do always end up with leftovers but the pudding holds beautifully in the fridge and still tastes amazing the next day. However, once it’s been chilling overnight I like to warm up my portion in the microwave before eating, just so it’s pleasantly warm. I dare say that whipped cream is a must and you should add a tablespoon (or 3) to each serving, but if this is not your thing vanilla ice cream in superb too. 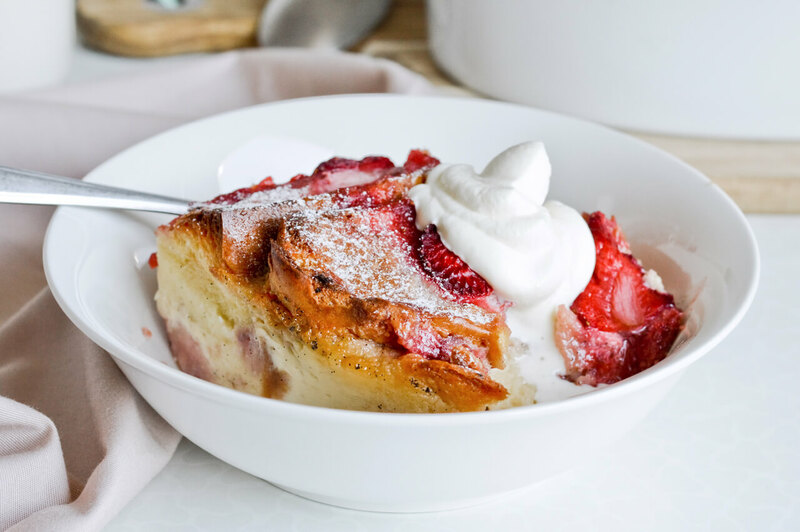 Perfect for brunch or as a dessert, this bread pudding is fruity and full of vanilla custard. Recipe comfortably serves 6 people, or even more. Preheat oven to 180°C (350°F). Slice the challah into about 1.5-cm (1/2-inch) slices, cut each slice in half, set aside. Butter a 32 x 20 x 6.5-cm (12.5 x 8 x 2.5-inch) oval baking dish and set aside. 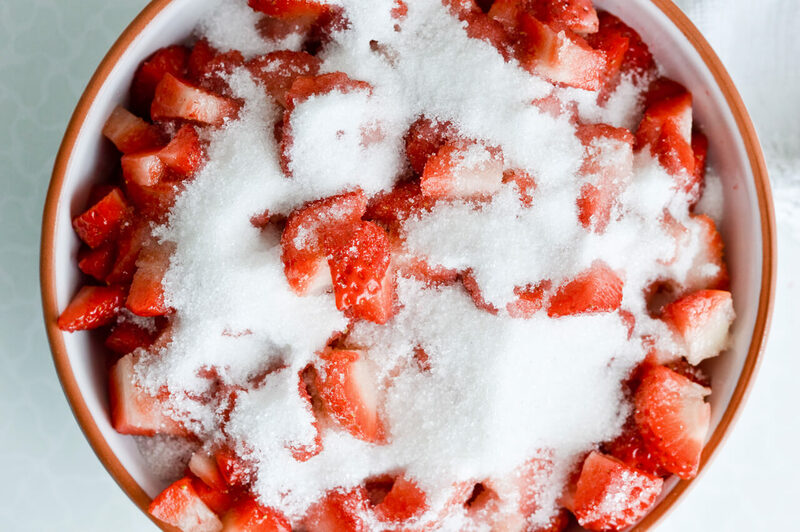 In a saucepan combine the strawberries, sugar, vanilla bean paste and lemon juice. Cook over medium heat, stirring ocasionaly, until mixture comes to a simmer. 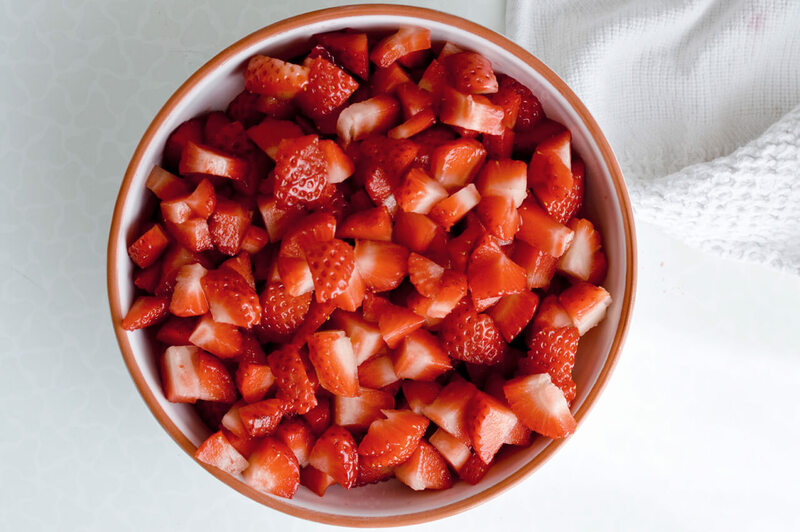 Cook like that for about 10 minutes, until the sugar dissolves, the strawberries release some liquid and become tender. Remove from stove and let cool. Whisk sugar and eggs in a medium heatproof bowl, set aside. Place milk and cream in a heavy saucepan, scrape in seeds from the vanilla bean and add the bean too. Bring to a simmer over medium heat, discard the vanilla bean pod and remove mixture from heat. Gradually pour into the egg mixture, whisking constantly as you do this. Arrange about 1/2 of bread slices in the dish, just enough to cover the bottom while still having some space between the slices. 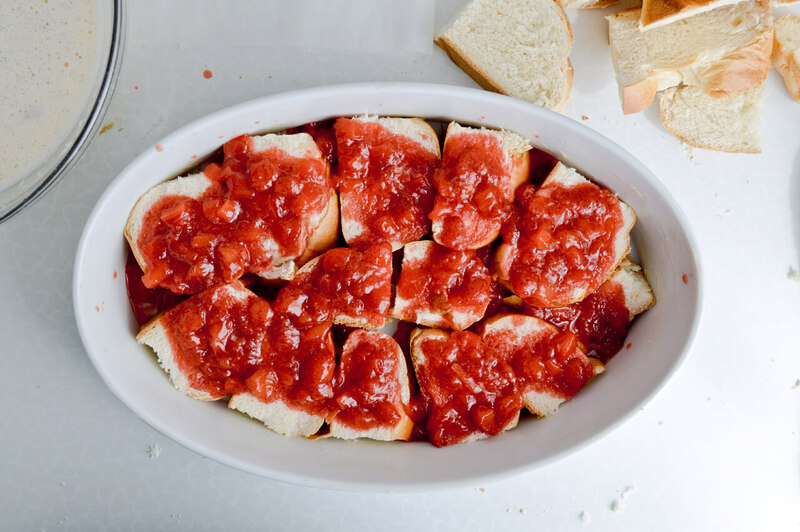 Spoon half of the strawberry sauce all over the slices. 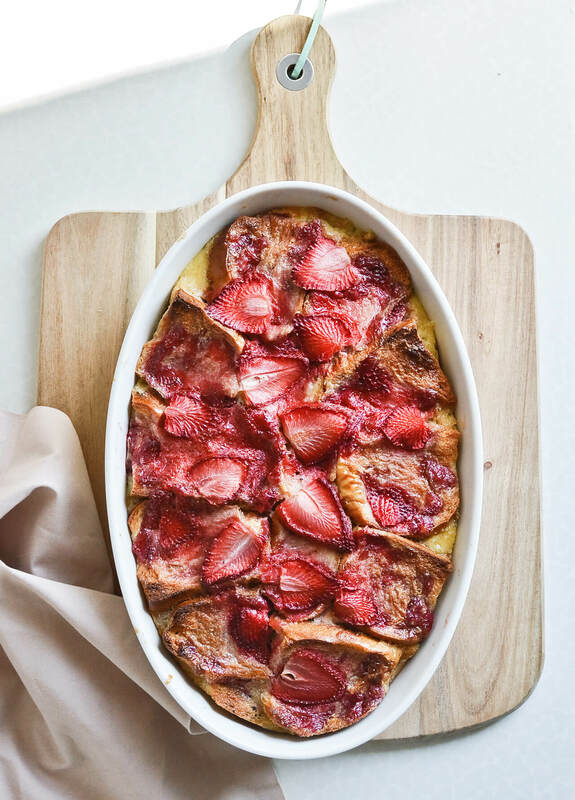 Top with the rest of the challah and strawberries. Slowly pour over the custard. 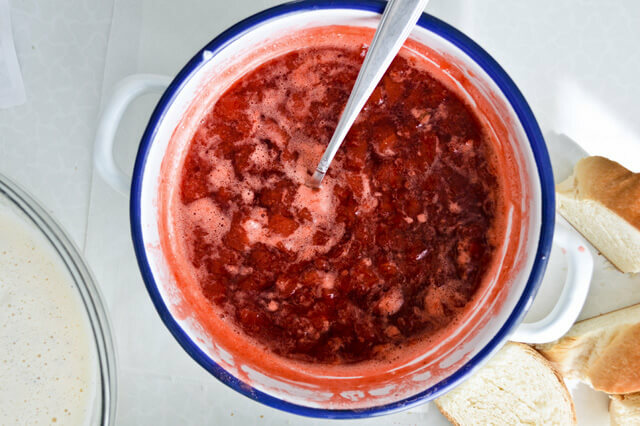 As the bread soaks in some of the liquid, gently press down the top layer with the back of a spoon. 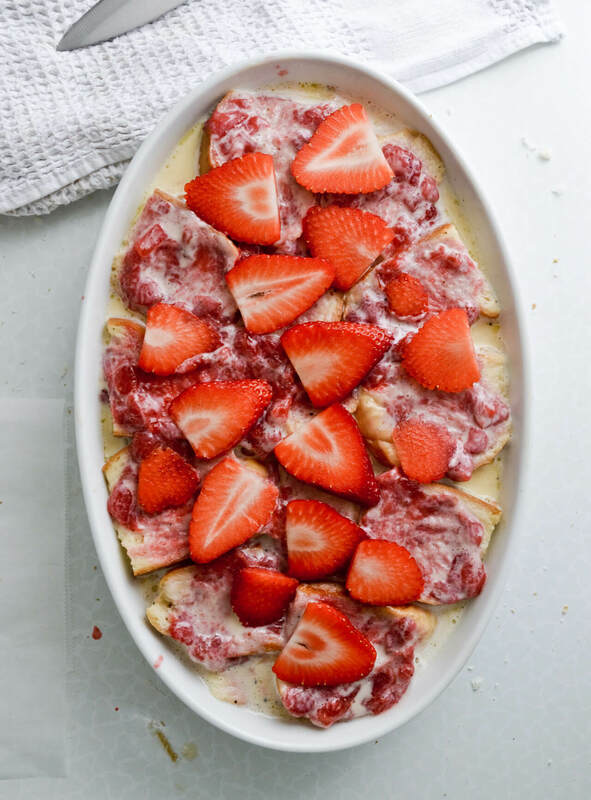 Lastly, arrange 3 sliced strawberries over the top of the pudding. Place baking dish in a roasting pan and add enough hot water to pan that it comes halfway up the sides of dish. Bake pudding for 50 minutes or until just set in the center (use a skewer to test it), remove it from the oven and let stand in water bath for another 30-40 minutes. The pudding should be completely set, the custard should not be runny and the strawberries will be nicely roasted. Remove dish from pan. Sprinkle pudding with powdered sugar and serve. 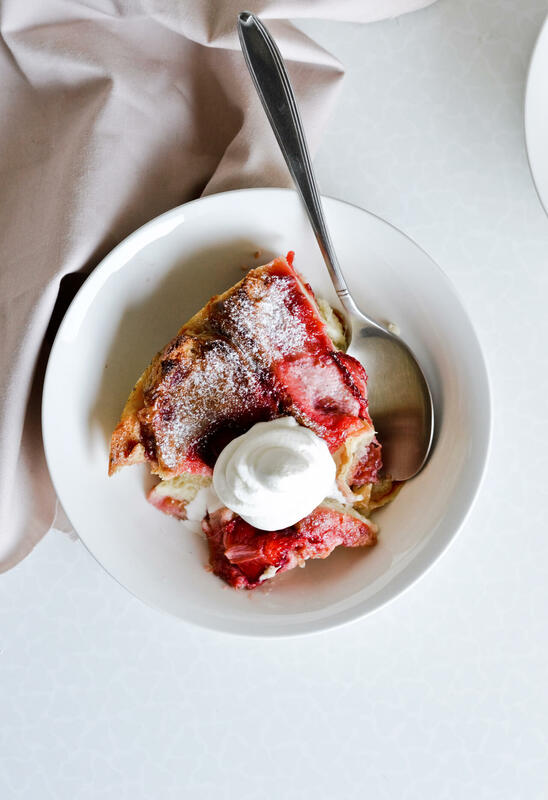 Spoon pudding into bowls or cut into slices and serve with whipped cream. Oh my gosh GORGEOUS! Looks absolutely delicious.